Posted May 24th, 2016 by Tom Wiltshire & filed under BBDs+Delays, Flanger, Projects, Stompbox stuff. Flangers are generally regarded as one of the most complicated pedals to build. A typical design has tons of chips and lots of circuit elements. Flangelicious isn’t like that. By using a microprocessor to generate an LFO-modulated clock signal directly, we can get rid of a lot of the non-signal path stuff and add features whilst we’re about it. 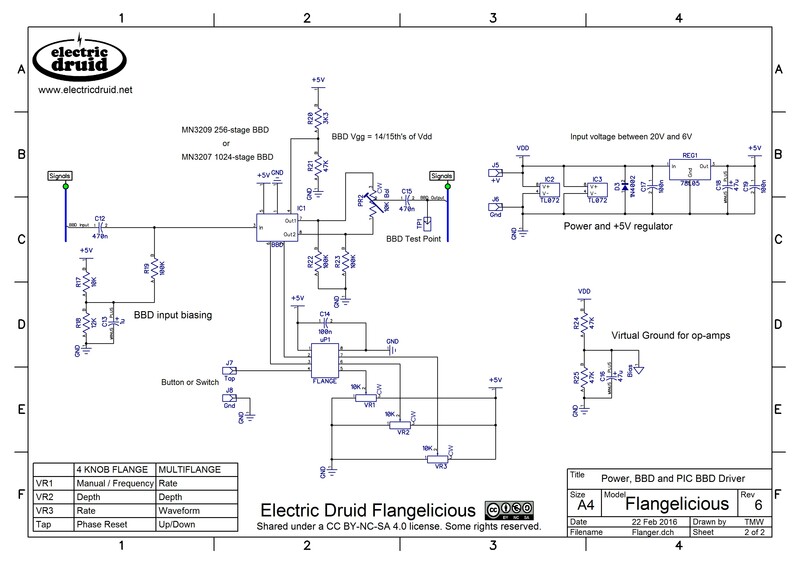 This gives us a much cleaner, simpler design for a flanger with a genuine fully-analog signal path. In fact, it can all be done with just four 8-pin ICs. To give you a flavour of the sound of the Flangelicious, here’s some sound samples recorded through the unit pictured above (my personal “blue meanie”). These are completely dry guitar samples played through the pedal and recorded into the computer – no amp, no amp modelling, no other effects, nothing. This pedal is the classic four-knob flanger version, equipped with an 1024-stage MN3207. 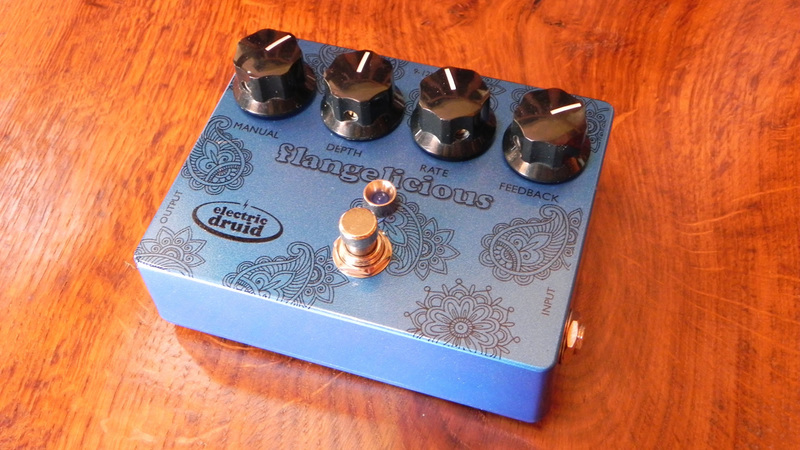 The Druid 4KNOBFLANGE chip offers control for Manual flanger frequency, Depth, Rate, and Resonance (Feedback). The LFO uses a specially shaped waveform which avoids the abrupt changes of a triangle LFO, but avoids the apparently-doing-nothing periods at the peaks of a sine LFO. Manual, Depth, and Rate are all variable using 0-5V control voltages. The chip outputs a biphase clock from 25KHz to 500KHz that can drive MN-series delay lines directly. 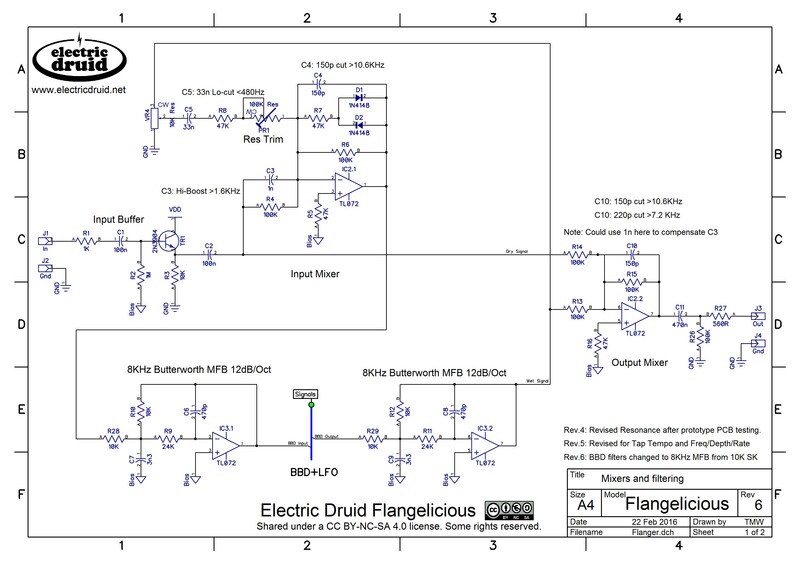 The Druid MULTIFLANGE chip includes an LFO with eight waveforms, including a “manual” mode for fixed flanger (“matrix”) filtering effects. Rate, Waveform, and LFO Depth are all variable using 0-5V control voltages. The chip outputs a biphase clock from 25KHz to 500KHz that can drive MN-series delay lines directly. So why build a Flangelicious rather than something else? Comparing the Flangelicious schematic with another flanger of your choice will show you the benefit to be gained by rolling up the LFO and voltage-controlled clock into a single chip. In some designs, this part is a third to half the circuit. What doesn’t change is the analog signal path – input mixer with feedback for that resonant flanger sound, pre-BBD filter, BBD, post-BBD filter, and output mixer to mix the wet and dry signals to produce the flanging. Luckily for us, this can be done with four op-amps and one BBD chip – just three more 8-pin chips. In the Flangelicious design, the BBD filtering is deliberately kept fairly light, and set at a frequency to give as much top-end as possible. Flangers love sounds with lots of rich harmonics, so it seems a shame to remove them all. For the same reason, there are tone-shaping components scattered throughout the circuit to boost harmonics but roll-off noise. These are all clearly marked and labelled, and are ideal places to start tweaking to customise the circuit for your perfect tone. 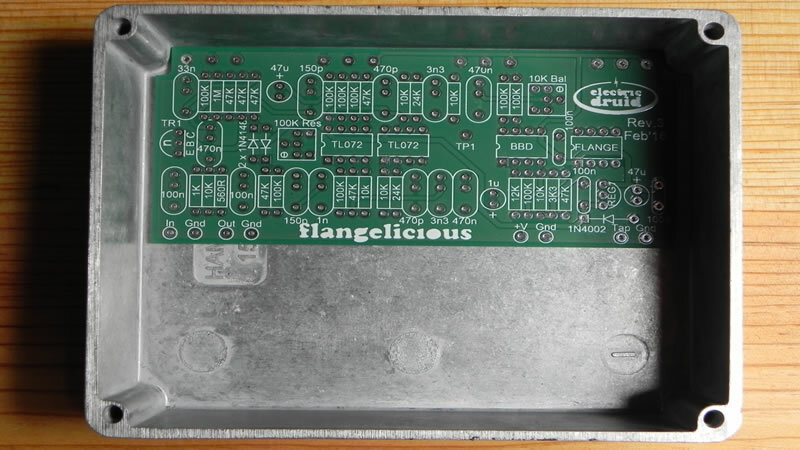 The Flangelicious PCB can accept either MN3209 256-stage delay lines or MN3207 1024-stage delay lines (or the modern equivalents like the BL3207). The different delay lengths provide different tonalities, but both provide a solid flanging sound. This project has been one of the most difficult to finish that I’ve worked on. I’ve been playing with it since at least summer 2012, so it’s been nearly four years on the bench. This one has really spent its time in development hell before it escaped to see the light of day. One problem is that the 8-pin chip only offers three analog-to-digital channels (CV inputs). This means that if you want to add a “Waveform” control, you have to drop the usual flanger “Manual” control. In the end, I decided that both options are worthwhile, so that’s what I’m offering. I’d be interested to hear what people think of this decision. On the positive side, I’m pleased with the code. It’s pretty sophisticated stuff for a 8-pin, 8-bit chip, and it makes full use of the both the features of the newer “Enhanced” 12F1xxx processor and also of all the coding tricks I’ve learned over the last few years. The interrupt routine is kept short, just reading values from ping-pong buffers, and the real work is done using DSP-style block processing as required in the main loop. Without these techniques, there’s no way this chip could pull this off. As it is, every single byte of the extremely limited RAM is used, and the Program Memory is over 95% full too, so even like this, it’s a tight fit. PCBs and programmed chips for this project are available in the shop. 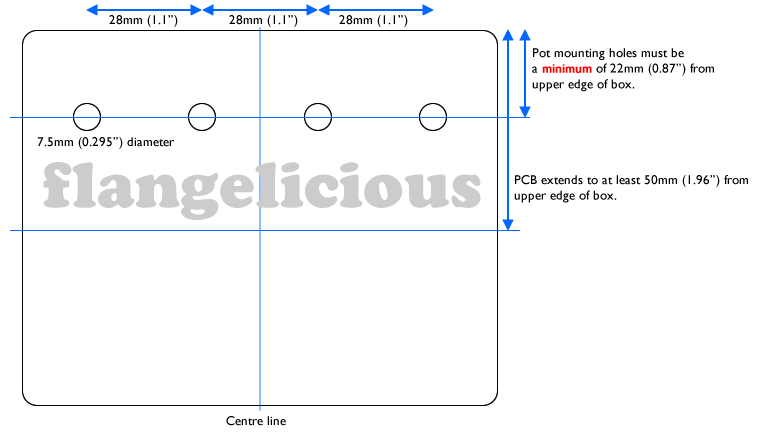 You need the Flangelicious PCB + chipset, which includes your choice of the two versions and BBD. You might also need a set of pots for the project. The photo above is the latest Rev.3 PCB, which allows for caps with a lead spacing of either 5mm/0.2″ or 7.5mm/0.3″ to be used to make life easier for DIY. For the build above I used my favourite Wima box film caps, which have a 5mm spacing. Similarly, the PCB layout for the two trimmers can accept the pinouts of several different types of trimmer. The PCB measures 106x48mm. It is designed to fit into a Hammond 1590BB enclosure in landscape format. The PCB-mounted pots make the build easier. Pop over to the shop and grab the Flangelicious PCB + chipset, which includes your choice of the two versions and BBD. You might also need a set of pots for the project. Alternatively, you can get a complete parts kit from Germany, from either Das Musikding (Four Knob Flanger / MultiFlange), or UKElectronic (Four Knob Flanger / MultiFlange). The only document which you’ll really need is the Flangelicious construction guide. The third revision of the PCB for this project is now finished, and I’m confident that it’s about as good as it can be. That needs manufacturing and testing, and then a large batch of boards can be made for the shop. The new board has improved BBD filtering, and allows for caps with a lead spacing of either 5mm/0.2″ or 7.5mm/0.3″ to be used to make life easier for DIY. This page has been heavily revised to reflect my decision to have both versions of the chip available. There will further updates shortly as the construction guide and other documents get listed. Flangelicious by Tom Wiltshire for Electric Druid is licensed under a Creative Commons Attribution-NonCommercial-ShareAlike 4.0 International License. Here’s the legal stuff. Ingenious! Could the same clock gen be used to drive a switched capacitor filter and make a Waheliciuos? Yeah, it probably could. Most switched capacitor filters need a clock x50 or x100 of their cutoff frequency. 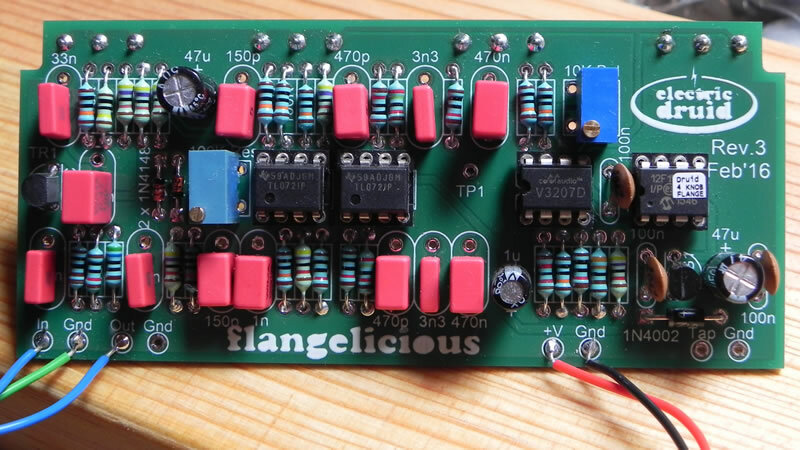 Since the Flangelicious clock chip produces 25KHz to 500KHz, that’d give you reasonable audio frequencies. With the multiple waveforms in this code, it’d make for a pretty wild filter effect. Let me know if you try it! DO YOU HAVE AN ESTIMATED TIME OF ARRIVAL ? Yes, I do, but then I keep failing to meet it because something else gets in the way. “Soon” is about as much as I can say right now. hi, hate to be yet another person asking for an ETA on this, but my friend has asked me to build them a chorus pedal and I have a choice between this, or filling a way overkill modular synth karplus strong pcb I’ve got lying around with a TAPLFO added. Will it be worth waiting for this PCB to be released or should I just build the overkill version? Thanks for your message. It’s nice that people are interested in the flangelicious already, so don’t worry about asking for an ETA. The second revision PCBs arrive on Monday. I don’t expect there to be any further problems with it, but I need to put one or two together to make sure.Since it’s untested, I’ve only ordered a few boards (5) but once it’s confirmed ok, I’ll order more. The code is basically done. I’m not totally happy with it (when am I ever?! I’m a tweaker!) but I’ve run out of memory in the chip, so I’ve got to admit that that’s it for this one! No more features can be added or improvements made, unless Microchip release a bigger version of the 12F1501. Hope this helps you make a decision about which one to build! Thanks for the reply! Can I email you and get first dibs on a PCB/Chip? I’d like a manual control. Would it be hard to add one in, analogue style in between the PIC and the BBD? Or would the PIC have to be reprogrammed to have no offset of it’s own (unless you add negative power to get negative offset)? Lastly, what are the dimension of the PCB? Thanks! With the multi-waveform version of the PIC (currently published) it’d be pretty much impossible to add a ‘manual’ control. The chip outputs a variable-frequency biphase clock signal between 25 and 500KHz. How do you add anything to that?! I’ve done another (more conventional) version of the PIC for the standard four-knob flanger. It uses a triangle wave with the exponential modulation (so hyper-triangular in linear terms) and the knobs are Manual/Frequency, Depth, Rate, and Feedback/Resonance. There’s the usual interaction between Frequency and Depth. If you increase the Depth, you don’t get so much range for the Frequency control, basically. At max depth, you don’t get any (the whole range is swept by the LFO). At min depth, you’ve got a static flanger you can set anywhere with the Frequency/Manual knob. I’m still wondering which chip should go in the shop? Standard flanger or freaky flanger? The two BBDs do sound pretty different – after all, 256 stages is two octaves higher than 1024 stages. Personally, I like the 1024-stage sound better – it has more of that deep whoosh that I associate with flangers. I guess you could wire a pedal up for both, but I think I’m probably just going to build two units so I’ve got one both ways! The PCBs are 106x47mm, designed to fit in a standard Hammond stompbox in landscape format. Rev.3 PCBs are tested and fine, and I’ve got more boards on order, so they’ll soon be in the shop. Prototype units have gone out to a few beta-testers for comments and feedback, and then I’ll order chips too. I’ve also got a construction guide document and a proper datasheet in the pipeline, so expect some changes to this page shortly. Hope that answers all your queries! Thanks for the interest. Thanks again for a great project, will definitley get one when they are available! I’m working on a chorus which is basically a modification of this board, since the circuits are so similar. As you say, stick in a 1024-stage BBD, and then you can adjust the filter cutoffs a bit, and you don’t need anything like so much feedback for a chorus. I’ve been tweaking the firmware a bit though, to try and get the widest range of usable chorus sounds out of it. The initial version felt a bit like a one-trick-wonder with a sweet spot but not a lot else. Changing this to a delay is more difficult, and I don’t know how many stages the PIC can drive. It’d probably depend on which BBDs you used because the clock pin capacitance (which is the limiting factor – too much capacitance and you can’t get a sharp rise time on the clock) varies between manufacturers, although it’s always more for longer BBDs. For delay, I have a different idea. As for the Flanger, I think this idea would deserve a deluxe treatment with the more sophisticated Tap-LFO chip. I would personally rather have THE flanger of my dreams with the parts count of a normal flanger than just a damned good better than most flanger with a low parts count. Not trying to poo-poo your damned good better than most project, just giving my opinion fwiw. Your opinion is appreciated! I need to know! I’ve been to-ing and fro-ing on that very issue. I think in the end, there’ll probably be several versions of this flanger. The basic plain-vanilla four knob flanger (maybe with tap tempo, if I ever manage to squeeze it into the code. I can’t let go of that idea..). The experimental multi-waveform flange-up/flange-down version that I started off with. And maybe, just maybe, a 14-pin all-the-bells-and-whistles version which has more options than anyone’s ever seen on a flanger, which would let people put what they wanted in and leave out what they don’t want. Although obviously, everyone will stick EVERY SINGLE KNOB on it and finish up with something that looks like a hedgehog that fell into a bucket of knobs. I’m just awaiting some feedback from my beta testers, and then I’m going to order a big pile of chips ready for the shop – so it should be early June. Will you be selling a pre-programmed 12F1501 chip? Yes, I will. Preprogrammed chips will be in the shop in early June. first, let me thank you for your generosity in sharing your fantastic projects. Your Tapflo made me buy my fist PIC-programmer – and showed me clearly my personal limitations when I tried to do some programming myself. Now I have been spending quite some time on making this work for me (which usually means a 1590a fit) and had my first success tonight. Hooray, it flanges!!! However, I think I am not getting the biasing right. Could you shortly explain what to look for when adjuisting PR1 and PR2? They seem to be highly interactive and the existence of a test point indicates that something could be measured regarding the BBD bias. I am using an MN3207 if it plays any role. Glad you like the projects and glad to hear your Flangelicious is flanging! The trims aren’t difficult to set up, so don’t worry. The easy one is PR1, the resonance trim. This sets the maximum resonance. Just turn the resonance control up to maximum, and then use the trim to adjust the maximum resonance to taste. Typically, you’d set it to the point just before the flanger starts to howl – but you don’t have to! PR2 is the clock balance trim on the output of the BBD. There’s no trim for the BBD bias, which is done with fixed resistors. The test point is there to give you a convenient place to attach a oscilloscope if you have one. This makes adjusting PR2 for minimum clock feedthrough very easy indeed. Alternatively, you can use a multimeter on an AC setting and adjust the trim for minimum level – probably 100mV or less. Finally, you can do it by ear. Turn the amp up loud enough you can hear some background noises and then tweak the trim until you get them as quiet as you can. There shouldn’t be any interaction between the two trims – they adjust quite different things. Good luck and enjoy your flanger! thanks very much for your quick reply. All right, I mislabeled a pot (shame on me). No wonder PR1 and “intensity” were highly interactive. So now PR1 is understood and settled. But I cannot grasp PR2. When I attach the mutimeter to the testpoint, the flanging fades away and finally stops altogether and the cicuit is only revived by unplugging and re-plugging the power. I already posted my copies of the schematics at DIYstompboxes (I hope you don’t mid, here: http://www.diystompboxes.com/smfforum/index.php?topic=114171.msg1059140#msg1059140). Would you have a peek what I’ve done wrong? Thanks a lot! Sure. I’ll see you over on DIYStompboxes.com. Hi tom been looking forward to this project for awhile, watching your progress with anticipation. Great to see it come to fruition. What are the design considerations with adding CV control for modular? Well, the CV that the PIC sees needs to be 0-5V, so you need to bear your input range in mind. The VCDO schematic has CV mixers you could use, although I inverted the CV inputs on that chip to make it simpler to use inverting mixers for the CV inputs and save an op-amp. If you’re programming chips yourself, that’s a sensible code tweak for a CV-controlled unit. In practice, the PIC’s ADC inputs are pretty robust and as long as you use a decent sized resistor (it was 4K7 on the VCDO) you can’t (don’t seem able to, anyway – I haven’t managed yet) blast them with enough current to kill them. I drew protection diodes on the schematic in the datasheet, but the Frequency Central “Waverider” modules never used them and I haven’t heard that those die unexpectedly, so the diodes can probably be regarded as “belt and braces” rather than essential. I’m quite interested in using the FLANGE chip for a chorus/vibrato project. Is the standard modulation waveform on the 4KNOBFLANGE suitable for vibrato along the lines of the roland ce-1 sinewave lfo vibrato? Would the MULTIFLANGE set to the sinewave modulation waveform be more suitable? Thanks. The 4KNOBFLANGE waveform would be fine for vibrato. Either triangle waves of sine waves are typically used for vibrato, and the 4KNOBFLANGE waveform is a blend of both! Technically, it’s a triangle wave without some of the upper harmonics, which leaves the points rounded instead of pointy. What might be a problem is getting the depth low enough. For a flanger, you want the widest sweep you can possibly get, and the Druid chips do a 20:1 range, which is over 4 octaves. You probably don’t want a vibrato anything like that wide! For this reason, I’ve been thinking of doing a separate version of this chip specifically for Chorus effects. I can’t give you a timescale though, so if you want to have a go with a FLANGE chip in the meantime, do let us know how you get on! hi Tom, great project . If I want to use with Bass guitars, and before I build it, what should I mod for bass frequency range? The unit will work fine with bass as it is. The only thing I would say is that I’d recommend the longer delay line – the 1024-stage rather than the 256-stage. The longer delay means the flanger’s notches go lower in frequency. I don’t know of anything in particular that I’d recommend, but there is no end of stuff online about programming PICs/AVRs. The Arduino world is a nice way to get into micro controllers, since the code is easy (compared to assembly language!) and there’s a lot of routines already done for you for common peripherals. Maybe have a play with an Arduino board and do some experiments with that. At some point, you’ll find you’ve outgrown what an Arduino can offer you and you want to go further (a bit more “bare metal”) but by then you’ll be familiar with the technology and techniques. Just about to buy the pcb and chip set (waveform selector) was just wondering if you could tell me the difference in choosing the 1024 and 256? The delay chip selection affects which part of the frequency spectrum is swept by the flanger, with the shorter delay higher and the longer delay lower. That provides two different tonalities but they’re both clearly “flanging”. another question, got the pcb. The trim pot footprint has six holes to allow more flexibility about which type of trimpot you use. If you look closely at the PCB, you’ll see that pairs of the holes are connected together. You can use any trimpot that uses one hole from each pair. That covers the ones with the legs in a triangle, both 0.1″ and 0.2″ wide, and it’s also possible to use the ones with the legs in a row. There’s a note about this on page 9 of the Flangelicious construction guide – have a read! I would like to know if it is possible to use synth levels with the flangelicious. The maximum signal level is limited by clipping diodes in the input mixer. This avoids overdriving the BBD which can’t accept a higher input level. If you wanted to feed a higher level through the circuit, you’d need to alter the R4/100K input resistor to that mixer (and adjust the C3 hi-boost capacitor) to reduce the level coming in, and then adjust R15 and C10 to compensate at the other end. Both of these mixers are simple inverting op-amps, so the gain equation is the familiar Rf/Rin. Is it possible that your pic chip would clock other 1024 BBDs such as SAD1024? I’m probably betraying an extreme naivety about these circuits with this question. Perhaps the MN32XX and SAD1024 require two different types of clock signal? It would be silly for anyone to design a novel circuit for such a rare expensive BBD, but they sound so good; it would be interesting to try one out in this design if they would be compatible with it. I don’t know what voltage the SAD1024 expects – that would be my only concern. Otherwise the flanger clock chips output a basic biphase clock that would drive any BBD. If the clock input capacitance is too high, the clock chip will need buffering, which is the same for *any* clock chip, not just a PIC-based one. But the SAD1024 has a relatively low clock capacitance I think, so that shouldn’t be an issue. So the only remaining problem would be the voltage level, but again, a simple buffer (CMOS, probably) would work as a way of converting the levels from the 5V output to whatever the SAD chip needs. I found your page looking for short BBDs, because I want to build an analog Karplus-Strong-thing. not being programmed by you..
I’m not so handy and I bought the flangelicious, I finished and it sounds amazing, but always sounding a lfo noise in the background, like a robot… When we are in a stage is disturbing.. Do you know why? It sounds like clock bleed through. A certain amount of background noise is normal, but you should be able to minimise it with the clock balance trim. Here is a nice mod you can try on this Flange. This mod creates a nice and unique sounding distortion. What you need to do is add a 3PDT toggle switch for the transistor in the circuit. The stock transistor is a 2N3904, and that goes on one side of the switch. And on the other side I put a BC557B transistor with the wrong pinout order. If you place it (the BC557B) in the correct order it adds a signal boost instead. By the way the BC557B is a PNP instead of a NPN. Remember to run the 3 center poles of the switch to the 3 hole of the transistor on the PCB. Also if you add the mod with the “Tap” function to reverse the order of the flange it ends up making the distortion sound really wicked turning it into a not so ordinary distortion. I experimented with different PNP’s and the one I mentioned has the right amount of HFE hitting that sweet spot. The HFE on the BC557B is 220 min. to 475 max., so if you get a PNP close to that it should work. I tried an MPSA92 with low HFE and it sounded good but not quite right; and I also tried a 2N5087 and the it had more distortion but slightly gated. An MPSA12 with huge HFE sounds crazy, but highly gated. Try it out guys and let me know what you think. could you explain to me how to connect the Tap up or down to the flangelicious pcb? It needs to be a latching SPST switch to ground. A toggle or a slide switch would be good. The MULTIFLANGE chip has an internal pull-up on the chip, so the pin only needs to be shorted to ground for the other option.